Animation Director Jan-Erik Sjovall talks two-tone videogame storytelling, Elika, massive battles and ‘meat and potatoes’ design. In hindsight, we shouldn’t have been surprised to discover that Ubisoft’s fifth home format Prince of Persia game, The Forgotten Sands, handles exactly like its first, Sands of Time, with all the monkey bars, pillars and pressure panels you can swing a time-rewinding dagger at. The project’s inherent retrospectiveness is, after all, right there plain as day in the subtitle. Ubisoft has never really ‘forgotten’ Sands of Time, of course: released in 2003, the game broke one mould for third-person action platforming only to trap itself, its creators and to an extent its own genre firmly inside another. The same-generation sequels, Warrior Within and Two Thrones, played with different narrative tones but kept the formula intact, and while 2008′s cell-shaded episode brought some interesting new ideas to the table, it repulsed as many pundits as it impressed. Besides upgraded though not quite razor edge looks and a new plot, which pits the Prince, fresh from his original Azad adventure, against a host of sand creatures unleashed on a besieging army by errant brother Malik, the second Xbox 360 and PS3 title makes use of elemental powers such as rock armor, ice projectiles and a wind area attack. When not in combat, the Prince can also freeze flowing water to provide scalable surfaces. Nothing all that game-changing, as noted, but enough perhaps to keep the franchise’s deep-rooted fanbase ticking over. Jan-Erik Sjovall, Animation Director, was on hand at the preview event to talk shop. And talk shop he certainly did. Read on. The Prince puts water sources in stasis to traverse a room from above. VideoGamesDaily: Thanks for making time for us, Jan. You worked on the art and cinematics for Prince of Persia 2008, which looked absolutely terrific. Jan-Erik Sjovall: We got an award for that from the Academy of Interactive Arts & Sciences for ‘Outstanding Achievement in Animation’, so yeah! Sjovall: It depends on where you are in the levels. The colour palette changes. So it’s very reddish-orange at the beginning, and changes towards blueish-green when you’re in the underground sewers and the prison, and then it lights up again – it really shifts, for all the maps. Every single map has a primary colour palette to it, there’s a primary colour for every map, so there’s massive thought put into this. VGD: Yes. Still, it does seem to be much less stylised this time round. 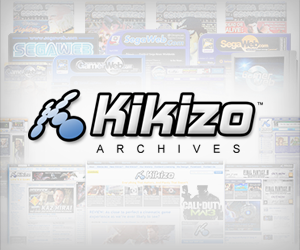 Did you find that the previous game’s aesthetic was too esoteric for some players? Sjovall: No, I don’t think that. 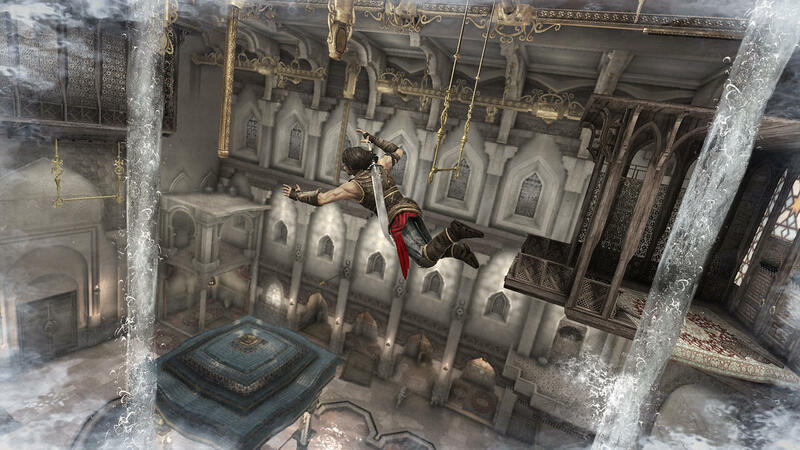 Of all the things that were put into this, there was a lot of thought process put into game design, level design, which move to take, how everything was put together, but for the visual art style, we simply said that the illustrative art style used for Prince of Persia 2008 is uniquely reserved for that brand. We wanted to go back and see what we could do with Sands of Time. Sands of Time was not necessarily meant to be photorealistic, but when you see the sequel, the sequel – let’s call it the sequel – to Sands of Time was actually internally Assassin’s Creed. 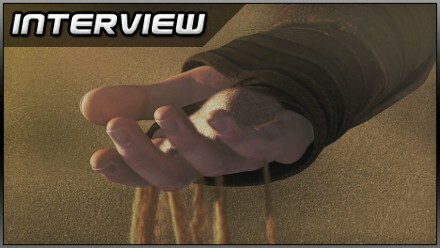 So Assassin’s Creed came out of the Sands of Time seam, the Prince of Persia seam. And they went photorealistic because they could. And if the technology had been there for PS2, probably Sands of Time would have been a photorealistic game. So that was the basic idea, we said ‘OK, we’ll make the game Sands of Time would have been if we’d had Xbox 360 or PS3 at the time it was made’. That was the idea. It has nothing to do with [the art design being too esoteric] – the same art director who did Warrior Within with the broodingly complex Prince and the heavy metal, that same art director was also doing Prince of Persia 2008 and that same art director’s now on this title. I call that range! VGD: Let’s talk about range in another sense. The Prince of Persia series isn’t quite as discontinuous as Final Fantasy, but every iteration of the Prince himself does seem to be an entirely different character. Who is the Prince for you, at this point? Sjovall: For me, of course, because I’m working on Forgotten Sands I think this is the Prince for me, in the sense that you take the Sands of Time guy and the Warrior Within guy and you merge them somewhat. So you have not as brooding, as goth-style a Prince, but he has seen some bad things, and that made him grow to a certain degree, so he’s a tough guy, he’s seen some stuff and he can hold his own. Posted in Interviews, Spotlight, and tagged with action-adventure, fantasy, hands-on, interview, North America, preview, Ubisoft Montreal, UK.